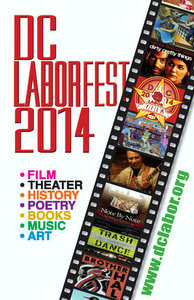 The DC LaborFest is a month-long celebration of labor arts in the nation’s capital. Work, workers and their lives and issues are explored through films, plays, poetry, music, art, literature and history throughout the month of May. Events are free unless otherwise noted; click here for the complete line-up. Please pass along & post widely on social media! PARENTS! Check out the Lest We Forget Mother's Day Family Festival today at the American Art Museum! Arts and crafts in the spirit of labor artist Ralph Fasanella, plus folk band the Knuckle Dusters and a puppet performance by Wits End Puppets! 11:30a-3p Saturday, May 10 at the American Art Museum (8th & F Streets NW, Kogod Courtyard); FREE. Part of the ongoing Ralph Fasanella: Lest We Forget exhibit. 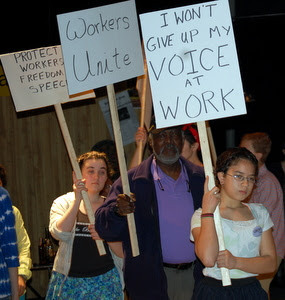 Today/Tomorrow: Shakespeare in a Union Hall: BROTHER HAL – today andtomorrow at 1 and 7 p.m. at the Round House Theatre/Silver Spring -- recasts King Henry V of England as Henry England, a union organizer leading auto workers in revolt against the France Motor Company of Flint Michigan. As re-imagined by Lumina Studio Theatre Executive and Artistic Director David Minton and Maryland Senator Jamie Raskin, Shakespeare’s Henry V is transformed into a rollicking musical, with songs by the likes of Woody Guthrie and Pete Seeger, performed by a chorus of exuberant young actors, who connect Henry’s underdog English army with the United Auto Workers who went on strike against General Motors in 1937. Brother Hal brilliantly realizes Lumina’s mission to give people of all ages access to that something in Shakespeare that defies the limits of time and place. Adapted from Mark Dewey’s review in DC Theatre Scene; photo: Metro Council President Jos Williams joins the young actors to rehearse for his guest appearance in the May 9 performance of Brother Hal; he was joined by Damon Silvers of the AFL-CIO and MD Sen. Jamie Raskin; photo by Chris Garlock. Final performances today andtomorrow; click here for tickets. SWEET JOAN OF THE TEXTILE MILL -- today and tomorrow at 5p at the Round House Theatre/Silver Spring -- examines the plight of child labor, performed by Lumina Studio Theatre's youngest actors (ages 8-10). Inspired by ideas and plot by Bertolt Brecht, SWEET JOAN focuses on the early 1900's as Joan stands up for the children and gets caught in the middle of a power struggle between two giants in the textile industry, but the dangers, and abuse, are still relevant with those most vulnerable worldwide. Tonight at 6:30 is a must-see multimedia program exploring themes of human rights and cultural expression at the Clarrisse Smith Performing Arts Center. MEXICAN REVOLUTION features both music and film, with Mexican popular songs performed by the legendary singer Eugenia Leon and PostClassical Ensemble, followed by the 1936 Mexican film masterpiece Redes. 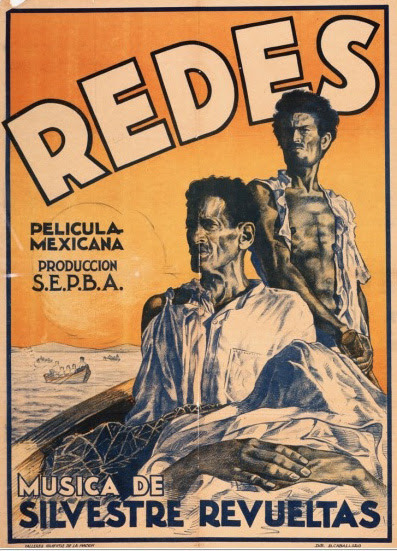 Redes is a 60-minute black-and-white film with lush cinematography by renowned photographer and cinematographer Paul Strand, co-directed by Emilio Gómez Muriel and Fred Zinnemann, who later directed HighNoon, From Here to Eternity and A Man for All Seasons. In telling the story of poor fishermen victimized by monopoly control of their market, Redes argues for organized resistance as a necessary means of political reform. Be sure to catch the AFL-CIO LOBBY DISPLAY at the Center, featuring posters and selected items from the George Meany AFL-CIO Archives recently transferred to UMD and join PostClassical Ensemble’s Artistic Director Joe Horowitz, Music Director Angel Gil-Ordoñes and Mexico based Roberto Kolb, the world’s leading Revueltas scholar, for a pre-show discussion at 6:30PM. 3800 Clarice Smith Performing Arts Center, University of Maryland, College Park, MD. AFL-CIO Book Club: "So Much to Do: The Life of Business and Politics" (Mon, May 12 noon, AFL-CIO) Richard Ravitch has been a prominent figure in American life since the 1960s, linking the worlds of public service, investment and labor. 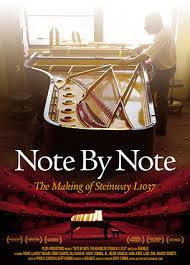 Film: Note By Note: The Making of Steinway L1037 (Mon, May 12 7:30p, AFI) Can craftsmanship survive in an age of mass-production and consumption? Riveting documentary follows the creation of a Steinway concert grand from forest floor to concert hall. Art Exhibit: Ralph Fasanella: Lest We Forget: Union organizer Ralph Fasanella celebrated the common man and tackled complex issues of postwar America in colorful, socially-minded paintings. Daily, American Art Museum (8th and F Streets, N.W.) 3rd floor North. 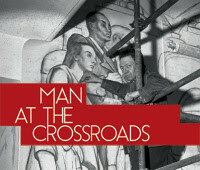 The AFL-CIO is also hosting an exhibit of Fasanella’s work in its lobby: 816 16th St NW. weekdays 8-5. The DC LaborFest is an expansion of the annual DC Labor FilmFest; both are organized by the Metro Washington Council, AFL-CIO.